Here in New York there always seems to be something to do or somewhere to be at night, so the only meals I’ve really been preparing lately are breakfasts. Summer is definitely here, and with it lots of delicious fresh produce – as well as sweltering days that leave you no choice but to skulk around the apartment, from fan to fan, in little more than a bra and jocks. But back to breakfasts. I try to resist the plumpening siren song of bagels and cream cheese every day. One thing that has made that easier is discovering that my obsession with tex-mex food could carry over to the breakfast table. Enter, huevos rancheros. There are many different ways to make these delicious Mexican breakfast eggs. My version is mostly a rip-off of a recipe from Smitten Kitchen (do follow the link for clearer instructional photos), with a fresh little salsa. 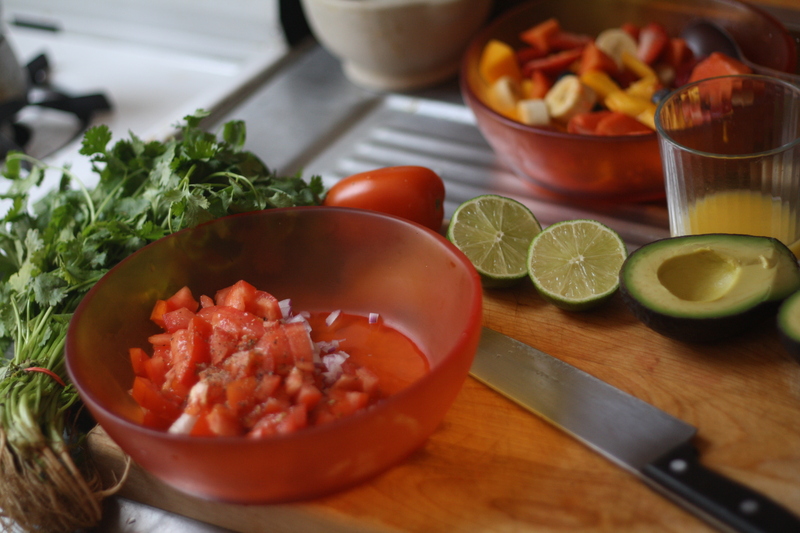 Start by chopping up half a red onion, an avocado, a tomato or two and a handful of cilantro (coriander). Squeeze over the juice of a lime, add some cracked pepper and sea salt and mix it all up. It’s somewhere between salsa and guacamole and I serve it with pretty much everything I cook. Heat up a tiny bit of oil in a non-stick pan, lightly fry a tortilla until it’s golden. Flip over the tortilla and sprinkle some grated cheese on top. I use fluorescent orange cheddar, but only because that’s how Americans seem to like to make their cheese. Once the cheese is melting slightly, crack an egg on top. Season with a little salt and pepper. It’s pretty impossible to keep the egg from running off the sides of the tortilla, especially if your stovetop or indeed entire kitchen is on a slant, like mine. Don’t stress. Things are only going to get messier and uglier from this point, but I promise the results will be delicious. Once the egg is about half cooked, you need to gently flip the whole thing over again and fry the other side of the egg for a few seconds. If you work out how to do this without egg going everywhere, please let me know how. Slide your concoction onto a plate, egg-side-up. Top with the avocado mix and lashings of sour cream. Fold it as best you can and eat it with your hands, wearing a shirt you can get food all over and a big grin. You’re welcome.